This is a sponsored post written by me on behalf of Hormel Foods for IZEA. All opinions are 100% mine. Did you know that September is the National Family Meals Month? We aim to have dinner together as a family every night, but with a new schedule full of team practices and meetings and youth groups, sometimes a sit-down dinner is hard to accomplish. The key for our family has been to find several simple ingredients to make quick family meals. That way, we’re still able to find the time to eat together instead of spending all of our time (and by “our time” I really mean my time) in the kitchen preparing for dinner. Simple meals that can be prepared quickly are the difference between everyone grabbing something at random times during the night and eating alone to having a set time that we all gather together in the kitchen to eat, bond, and chat about our day. This past week, I found it tough to transition back to our normal (very busy) routine after returning from my trip to Los Angeles. Luckily, I was able to pick up a can of Hormel® Premium Chicken Breast, which is an easy way to add great-tasting, satisfying protein to our meals. Because everyone in my family loves Caesar salad, I decided to make a dinner version of our favorite salad. All I did was add some Hormel® Premium Chicken Breast and wrap it all up in a wrap/flatbread, stick some tooth picks in it, and slice to eat. 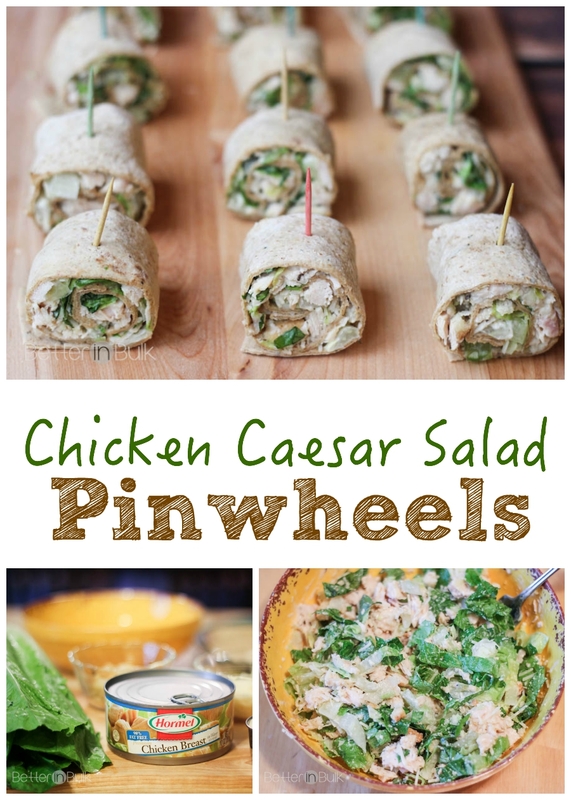 We paired the chicken Caesar Salad pinwheels with some other finger foods (which are SO popular with my kids!) like carrots, cucumber, and fresh tomatoes for our garden. nights that you don’t want to heat up the kitchen cooking! This is the recipe you’ve been looking for! Each flatbread serves one person a lunch-sized portion, so four servings. 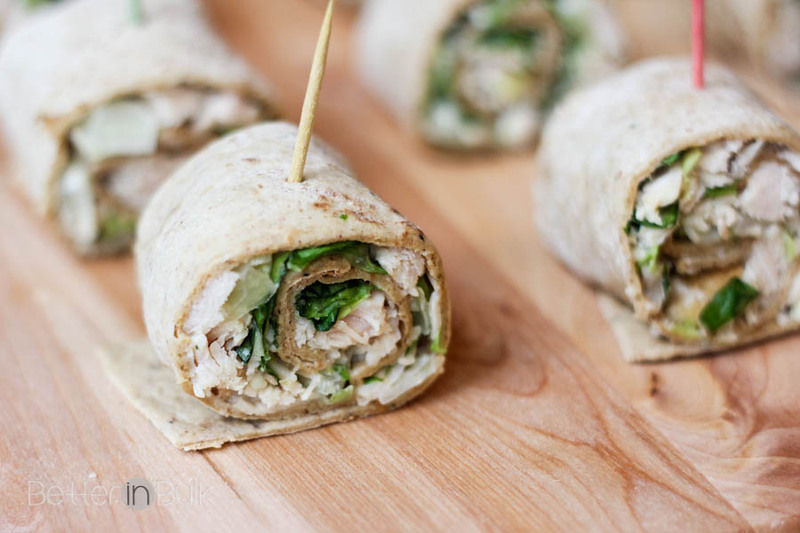 I love Chicken Caesar Salad and these little roll ups look fantastic. I can’t wait to try them. Shared and Pinned. Thank you for sharing on Think Tank Thursday. I found you at the pinch of joy blog link up. What a great recipe, I need to make that, I love wraps, and ceaser salad! 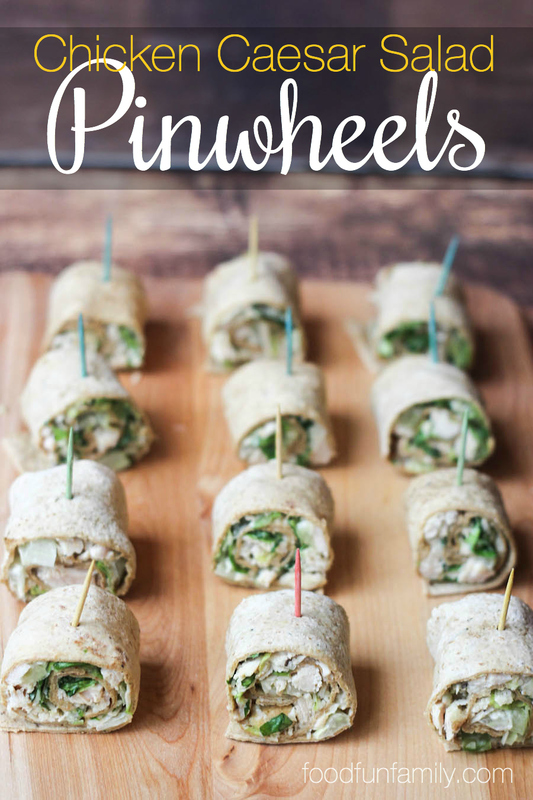 What a light and delicious lunch idea (or a great appetizer option)! This sounds so delicious!